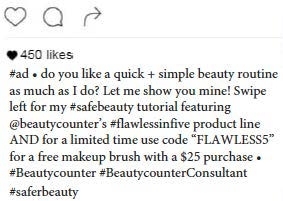 If you receive free products or other perks (e.g., coupon codes) from Beautycounter ("BC") with the expectation that you will promote BC's products via a social media platform such as, but not limited to, Twitter, Facebook, lnstagram, Snapchat, and/or YouTube, then you are an "Endorser" for the purposes of these guidelines. All Endorser posts that mention a BC product or the BC brand must comply with these guidelines. Endorsers must always clearly and conspicuously disclose their relationship with BC, in compliance with FTC's Endorsement Guides. To this end, you agree to the following. In every post that you create in response to receiving free Beautycounter product(s), discount(s), or other perk(s), you agree to disclose what you received. You might state, for instance, "I just received a complimentary Perfect Match Lip Set from Beautycounter." You also agree to use "#GiftfromBC" in every such post. This hashtag will appear before the "more" button or any other similar button. This hashtag will also appear with two or fewer other hashtags. If you are posting a video in response to receiving free product(s), discount(s), or other perk(s), you agree to use "#GiftfromBC" at the beginning of the post. You also agree to disclose the connection to BC within the video itself. At the start of the video, you might state, "I just received a complimentary Perfect Match Lip Set from Beautycounter." You agree to use only those claims appearing on the product pages at the BC website (www.beautycounter.com). You agree that any representation you make in connection with BC reflects your honest opinions, findings, beliefs, or experiences with BC and BC products, and will not contain any statements or representations about BC, that to the best of your knowledge, are untrue or deceptive. If your opinions, findings, or experiences mentioned in the content change, you are responsible for updating the content or, if that's not possible, for promptly informing BC of such change. You agree to avoid impersonating another person or pretending you are someone else when posting content. You agree to avoid stating or suggesting (through images or other means) that a BC product will treat or prevent any disease or medical condition including, but not limited to acne, psoriasis, or rosacea. You agree that content does not, to the best of your knowledge, infringe the copyright, trademark, privacy, publicity, or other personal or proprietary rights of any person or entity. You agree that content does not contain trademarks or other registered marks owned by others unless you have obtained written permission from the owners. If any persons appear or are referred to in the content, you agree to be solely responsible for obtaining, a valid release from such persons, which permits BC the right to exhibit and use the content. Such release will be obtained prior to posting or making content publicly available. If any persons appearing in any content is under the age of majority in their state, country, or providence of residence, the signature of a parent or legal guardian is required on each release. Content that is lewd, obscene, sexually explicit, pornographic, disparaging, defamatory, libelous, or otherwise inappropriate at BC's sole determination, may not be posted or made publicly available and BC, in its sole discretion, may remove such content or require that you remove such content. You agree that content will not contain any personally identifiable information (such as, but not limited to, license plate numbers, personal names, e-mail addresses, or street addresses) of any person other than you. Should you include personally identifiable information about yourself in the content, you acknowledge and agree that such information will be disclosed publicly and that you are solely responsible for any consequences thereof. You agree that to the best of your knowledge, content will not defame, misrepresent, or contain disparaging remarks about other people, companies, or products. You agree that content will not violate any law. 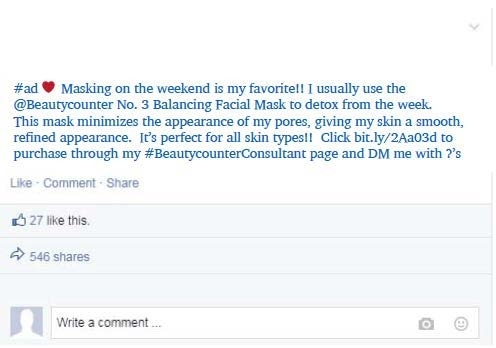 Disclosing Your Material Connection to Beautycounter: All Endorsers who feature Beautycounter products in their posts must disclose their connection to the company in every social media post that mentions (or shows) Beautycounter branding or Beautycounter products. To do this, include "#GiftfromBC" in each such post, above the "more" button. Also, you must describe in your post what you received. Note that social media posts are not limited to text appearing on a Facebook, lnstagram, or Twitter post. These guidelines apply to videos as well. For example, when utilizing the "stories" function you should begin the video with a disclosure that gives your viewers the information they need, such as, "Hi, Beautycounter gave me (name of product), and I think it's great" or "The products I'm going to use in this video were given to me by their manufacturers." 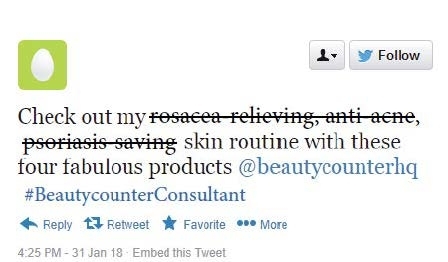 Product Claims: All product claims that you post on social media must use the same or similar language as the product pages at www.beautycounter.com. Any changes to the language must not change the meaning of the clams. Claims that move beyond those on www.beautycounter.com are prohibited. No Disease Claims: Because cosmetics may not be marketed as treating or preventing any diseases or medical conditions including acne, psoriasis, and rosacea, this blogger's claims are not permissible for promoting Beautycounter products. Cosmetics are intended to cleanse, beautify, promote attractiveness, or alter the appearance. Reference the Beautycounter website at www.beautycounter.com for content ideas.